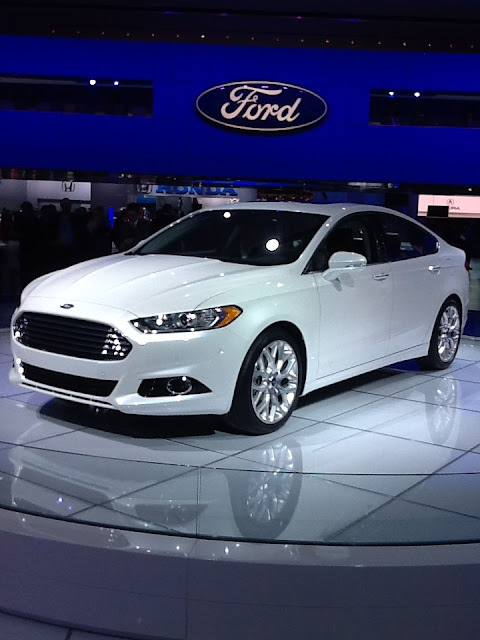 Shane Shirley : Just How Sustainable is the 2013 Ford Fusion? 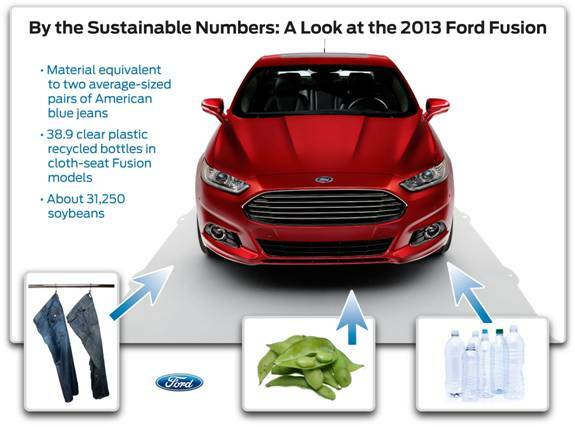 Just How Sustainable is the 2013 Ford Fusion? Okay folks so I have seen and fallen in love with the totally redesigned 2013 Ford Fusion not only because it is absolutely beautiful, but because it is an eco-friendly, green living, sustainable ride like no other. When Ford’s all-new Fusion hits America’s roads this fall, it will carry some unexpected green materials beneath its aerodynamically fuel-efficient body: Denim material equivalent to slightly more than two average-sized pairs of blue jeans, 38.9 clear plastic 16-ounce recycled bottles and about 31,250 soybeans. Ford is committed to protecting not only it's customers but our environment as well. Noise, vibration and harshness (NVH) control is held to world-class standards in the all-new Ford Fusion with post-industrial, recycled cotton used as sound-absorbing material. In every Fusion, the denim equivalent of slightly more than two pairs of average-sized American blue jeans helps to nullify unwanted road, wind and powertrain noise. Paired with other noise- reducing practices and techniques Ford engineers have implemented for years, the 2013 Fusion will provide customers with a quiet, relaxing driving environment. Fusion’s North American cloth seat surfaces are made with 100 percent REPREVE® yarn, which is a hybrid of post-industrial and post-consumer waste (or materials once utilized for industry purposes and materials used by everyday consumers). 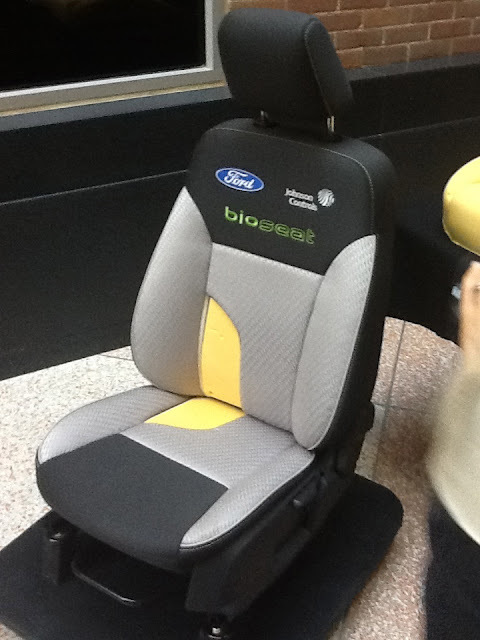 Cloth-seat Fusion models contain the equivalent of 38.9 recycled, clear 16-ounce plastic bottles and I have felt the REPREVE® fabric and it feels very durable but it is also very comfortable. Post-consumer plastic water and soda bottles are collected, chopped, ground, melted and reformulated into chips. These chips are then extruded and textured into fiber. The fibers are then used in the creation of fabric, then dyed, finished and rolled for shipment. Excess fabric from each procedure in the process is recycled back into the system to further eliminate waste. The foam used in seat cushions, seat backs and head restraints is a soy-based sustainable material, with the equivalent of approximately 31,250 soybeans. Ford first used soy-based foam in the Ford Mustang in 2007 and today, Ford uses soy foam on every vehicle built in North America. Plus, get this, Ford’s use of soy foam has reduced petroleum production by more than 5 million pounds and carbon dioxide emissions by more than 20 million pounds annually! Every 2013 eco-friendly Fusion utilizes plastic made from recycled car battery casings. And just think about it, these post-consumer materials were otherwise destined for a landfill. This plastic may be found in fender splash shields and other underbody components. Annually, these applications on the Fusion utilize close to 2 million pounds of recycled plastic. “We are holistic in reducing our environmental footprint by utilizing post-industrial (blue jeans), post-consumer (battery cases) and sustainable materials technologies (soy foam),” Majeske says. “We do whatever makes the most sense for each application and environmentally from a lifecycle perspective. “These are steps our customers can appreciate, they are cost-effective and they are better – in the long run – for our planet,” she adds. When I was at Ford Motor's in January, I heard from Ellen Lee, Plastics Research Tech Expert and Angela Harris, Plastics Research Engineer with Ford Motor Company's Sustainable Materials Lab. They showed me how Ford makes materials out of sustainable foods like coconuts and soybeans. Take a look and stay tuned for more innovations from Ford here on EB. I am heading back to Dearborn in June to find out exactly what they have in store for consumers in the near future.